If we all could be more like St. Joseph. What a strong man that God chose to be a protector of the Virgin Mary and Jesus! Strong, wise, and steeped in love for God. If we could all have the faith of St. Joseph, we would all be saints. Many called by God before the time of St. Joseph questioned God. Moses questioned God on how he would speak, Abraham questioned God about the lack of an heir. When did Joseph question about what God was asking him to do? Never. We have no words from St. Joseph in scripture. I think this silence speaks volumes. He dreamed dreams, which were instructions from God's messengers that told him what to do and where to go. St. Joseph in his faith and humility, receives the message, has absolute faith that it is from God, and then acts. He responded to dreams 3 times, and 3 times he did not ask God any questions, he just obeyed. "Joseph rose and took the child and his mother by night and departed for Egypt. " 3. The Return to Egypt: Matthew 2:19-23. "...behold, the angel of the Lord appeared in a dream to Joseph in Egypt....."He rose, took the child and His mother and went to the land of Israel." I think we skip over these scriptures in the bible without really thinking about them. The dreams = miraculous, but St. Joseph's reaction shows why he is a saint. He did not question the dream, the message, his task, or what was to come as a result of his obedience. I think we all go down the road of ..."But Lord what if such and such happens.." or... "Lord, are you SURE about this? ".....Joseph didn't. 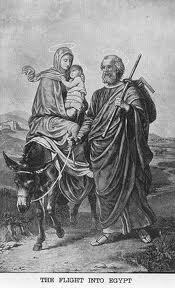 We must remember that God sent a carpenter into a desert (not too many trees...) with no job, no home, and no contacts, but yet, even with all these obstacles, Joseph didn't question God, he just.... "Joseph rose and took the child and his mother by night and departed for Egypt. 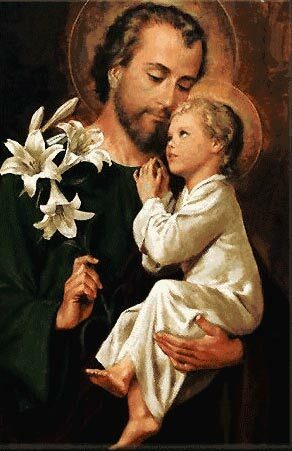 St. Joseph, dreamer of dreams...teach me obedience.